Powledge Unit is a minimum security prison located in Palestine Texas, part of Anderson County. The facility has the capability to house 1,137 male offenders, and typically houses close to this limit. Built in 1982, Powledge Unit was originally named Beto II Unit, and later in 1995 was renamed after the assistant director of Contract Construction Louis C. Powledge. The facility is comprised of a main unit which houses offenders in 14 dormitories, each with approximately 53 inmates. In addition to general population dormitories, Powledge Unit has two dorms dedicated to assisting inmates with medical needs, and a 30 single cell Administrative Segregation Unit. 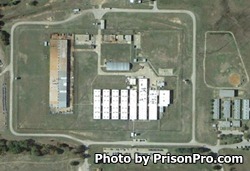 The Trusty Camp is located just outside of the Main Unit's perimeter fence and houses 321 inmates. Offenders incarcerated in Powledge Unit are provided work opportunities that provide internal support to the facility. These job assignments include food services, chaplaincy, maintenance, laundry, and working for the Texas Corrections Industries in a metal fabrication operation. The metal fabrication plant is located on the grounds of Powledge Unit. Additional work details include working in a poultry egg laying operation, raising and finishing swine, farming edible crops, and raising/caring for cattle. Offenders are provided vocational courses that teach useful skills such as welding, painting, and automotive collision repair. Educational courses provide inmates with literacy classes, adult basic education classes, and the ability to earn a GED during their incarceration. Powledge Unit is secured by a perimeter fence and four armed guard towers that are operational around the clock every day of the year. Powledge Unit provides visiting hours for all inmates during the weekends (Saturdays and Sundays) from 7am to 5pm. Offenders who are housed in the Expansion Cellblocks are allowed visits by appointment only on Mondays and Fridays, call the facility for more information.